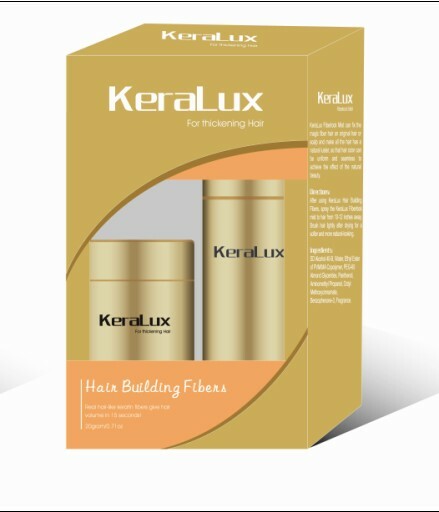 KeraLux Hair Building Fibers make thin hair look thick and natural in 15 Seconds. Made of keratin protein, KeraLux will not clog pores nor will it dry out the scalp. It has strong magnetic attraction to thin hair, and will not come off on clothes/pillows. It can stay on head as long as a week if without shampoo. Use on dry hair. Towel dry or blow-dry your hair. Hold the KeraLux Hair Building Fibers 3-6 inches above the thinning area till can not see the scalp. Pat your hair to scatter the fibers throughout with a natural look. Apply the KeraLux Fiberlock Mist to hold the fibers. KeraLux Fiberlock Mist can fix the magic fiber hair on original hair or scalp and make all the hair has a natural luster, so that hair color can be uniform and seamless to achieve the effect of the natural beauty. After using KeraLux Hair Building Fibers, spray the KeraLux Fiberlock mist to hair from 10-12 inches away. Brush hair lightly after drying for a softer and more natural-looking.